A vast area of rice and fish ponds. 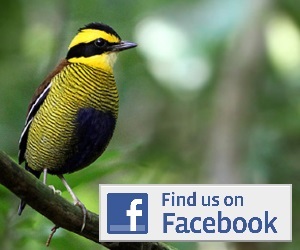 Great for waterbirds, munias, Sunda Coucal and maybe Javan Lapwing?? Muara Gembong is the name given to a vast area of rice paddy, fish ponds and degraded mangrove to the east of Jakarta. Despite its proximity to Indonesia’s capital, Muara Gembong has a very ‘wild’ feel to it. Much of the rice paddy is so low lying that it cannot be irrigated and so relies on rain only. The consequence of this is that only one harvest a year takes place (as opposed to three on irrigated rice lands) and so at any given time vast areas are fallow, providing excellent habitat for open country birds. 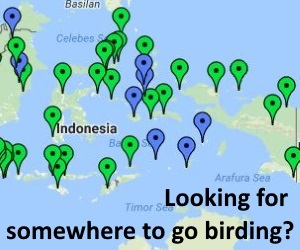 For birding in Muara Gembong there are a few options, the most obvious of which is just to wander off in any direction that looks interesting! Try heading to the village of Harapan Pantai Indah, which lies pretty much at the end of the main access road, From here a path heads north, crosses a river by a small ferry, and enters a huge area of fallow rice fields, scrub and grassland. This is a good area to look for White-capped Munia, Java Sparrow and Sunda Coucal. It is also the site of report of Javan Lapwing in 2003 (that’s Lapwing, not Plover!). Further to the west and north the land becomes dominated by fish ponds and degraded mangrove. This would be the place to look for Javan White-eye. Another alternative is to hire a small boat from Harapan Pantai Jaya (just ask in the small shop if there is a boat available for a few hours). With a boat you can explore the many tidal channels, getting on and off as it suits you. If you follow the main channels to the sea you can get a chance of more waders (if the tide is right) or Christmas Island Frigatebirds sitting on the offshore fish traps. Another similar area worth a try is known as ‘Singkil’, This lies before the main east-west dyke on one of the many small roads from Bekasi (in east Jakarta) to Muara Gembong proper. From the village of Singkil walk across the fields in the direction of the sea and the path enters an area of fish ponds and scrub. This area can be good for wader and both Java Sparrow and breeding Asian Golden Weaver have been recorded here. Muara Gembong is best reached with a car. Finding your way to Pantai Harapan Jaya is not easy however, and it is unlikely any taxi driver will ever have heard of the place. If you are interested to try getting there, it may be easiest to send us an email or post a comment below. We will then try and figure it out depending on your circumstances. It may be possible to get basic accommodation (on someone’s floor) at Pantai Harapan Jaya if you ask the Kepala Desa nicely. Alternatively getting to and from Muara Gembong is a feasible day trip from Jakarta (taking around 2 hours from the centre of Jakarta).